Thirty of London’s leading Women in Food are being celebrated as part of the capital’s Urban Food Awards, championed by the Mayor of London. Asma Khan, Darjeeling Express: Asma owns Darjeeling Express, a restaurant with an all-female kitchen which gives women with no former professional kitchen experience an opportuntiy to shine. In her words, a warrior! Sarah Vaughan-Roberts and team, Forty Hall Vineyard, Enfield: Sarah pioneered the Vineyard back in 2009 by hand-planting an acre of vines with a team of volunteers. Now FHV has 10 acres producing award winning organic wine with all profits from sales being put back into 'ecotherapy' mental health and wellbeing projects. Sarah leads a committed small team of part-time, mainly female, staff and volunteers. Helen Carvall & Tracey Langridge, Head Teachers at Rockmount Primary School, Croydon: Helen and Tracey are co-head teachers and along with their commited team of staff, they have transformed breakfast, snack, after-school food provision and school meals at Rockmount resulting in an uptake of school meals. They have also built an Edible Playground and integrated food into the schools curriculum with 37% of puils now eating 5 a day, compared with 20% borough-wide in other schools. Sadhbh Moore and Abi Glencross of The Sustainable Food Story: Their roving supper club connects citizens to the origins of our food through interactive dinners, workshops, events, and food experiences. They grow produce, use surplus goods, forage, and discuss food and farming through stories. Josephine Liang, Day Old Eats: Described as the Robin Hood of the food surplus movement, Josephine takes pastries and artisan baked foods from high-end bakeries and sells them on to make money for charities fighting child hunger. In her ‘spare time’ she campaigns on food waste, is creating a scheme to give better access to healthy food in Camden, and has a foodie Instagram featuring feasts made from surplus food. "I’m delighted to see the Mayor’s Urban Food Awards recognise and celebrate some of the most inspirational women working to improve food in London. Following the success of the Mayor’s ‘Behind Every Great City’ campaign, the ‘Women in Food’ category profiles a number of women doing great things for food—whether it be in food education, community food, good food enterprise, or campaigning.” commented Claire Pritchard, Chair of the London Food Board. The winners were celebrated at the Urban Food Awards on 20 March, which is run in partnership between the Mayor of London, the London Food Board, and London Food Link; the capital’s good food network. Good Food For All: Brixton Pound Café — a pay-what-you-can community café using surplus food. Good Food on Prescription: Apicultural — improving the environment for people and pollinators through therapeutic food growing and beekeeping. Innovation and Tasty Tech: Plan Zheroes — A food donation platform that helps businesses quickly and safely donate surplus food to nearby charities. Sugar Smart Hero: (Joint winners) The John Roan Kitchen and Notting Hill Adventure Playground both creatinging SUGAR SMART environments for children. Super Social Enterprise: Bread n Butter CIC — run educational workshops on how to cook, eat, and live healthily, sustainably, and independently. Surplus Superstar: Calthorpe Project — a 1.2 acre urban green oasis in the heart of the capital that uses its waste to power the garden and café. Veg City Champion: Veggie Run, Havering Council — a school based app which has increased the uptake of healthy school catered meals for children aged 4 -11 years. Women in Food, Asma Khan, Darjeeling Express —owns Darjeeling Express, a restaurant which opened in June 2017 and has an all-female kitchen team, with an average age of 50. Sadhbh Moore and Abi Glencross, The Sustainable Food Story — their roving supper club connect citizens to the origins of our food through interactive dinners, workshops, events and food experiences. They grow produce, use surplus food, forage, and discuss food and farming through stories. Jacqui Shimudzu, Hill Station — runs a community café, art space, craft cooperative, training resource, social hub, and music venue run by local people for local people. Julie Brown, Growing Communities — leads social enterprise Growing Communities in changing the face of better food retail through a veg scheme, farmers' market, urban agriculture, and organic horticultural training. 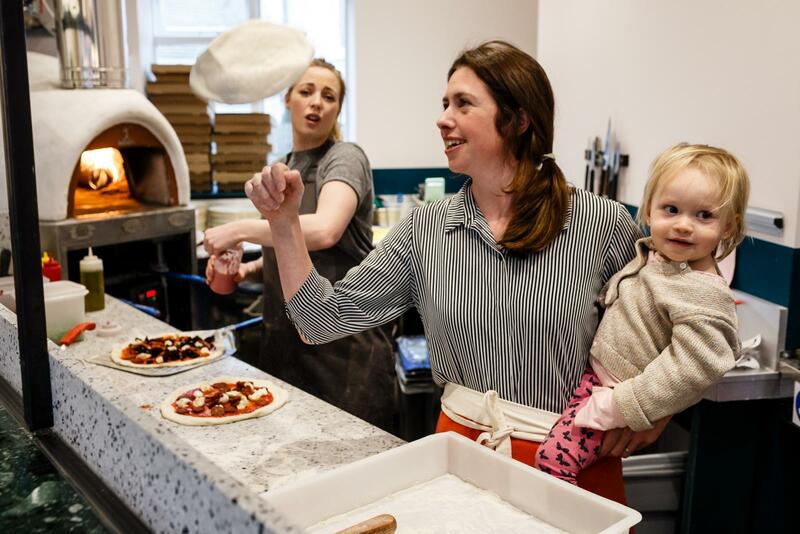 Laura Hern, Emma Miles, and the team at the Clerkenwell Kitchen — have championed sustainability, animal welfare, affordability, and fair pay for over 12 years. Every dish uses seasonal produce with a focus on plant-based ingredients, and the kitchen has built strong relationships with local producers. Sarah Vaughan-Roberts and team, Forty Hall Vineyard — London's only commercial scale vineyard. Sarah pioneered the Vineyard back in 2009 hand planting an acre of vines with a team of volunteers. The ladies of Cranbrook Community Food Garden, Bethnal Green — set up the project on a derelict playground and now grow food together, encouraging gardening as a means of recreation, promoting health, wellbeing, social cohesion, and as a sustainable way of life. Daniela Jamois, Charles Dickens Primary School — runs an eco council and gardening club that look after a food garden at the school. Helen Carvall & Tracey Langridge, Rockmount Primary School — with their team have transformed food education and food provsion across the school community and now help other schools do the same. Stephanie Wood, School Food Matters — through campaigning and food education, Stephanie helps children enjoy fresh sustainable food at school and learn where their food comes from. Sara Ward, Hen Corner — this urban smallholding and microbakery brings real food to our communities through training, schools work, and sale of produce. Laura Winningham, City Harvest — Laura is the CEO of London's first surplus redistribution charity, City Harvest. Women in Food, Josephine Liang, Day Old Eats — take pastries and artisan baked foods from high-end bakeries and sells them on to make money for charities fighting child hunger. Natalie Favre, Be enriched — working at this youth and community charity, Natalie runs cooking courses alongside community members giving them the skills and confidence to share with others. Rebakah, Oasis Hub Waterloo — Rebekah runs a busy foodbank and makes a huge impact supporting people in crisis in a holistic way through socialisation, debt advice, and training. Sarah Bently, Made In Hackney — Sarah founded this plant-based community cookery school and charity that empowers people to grow, cook, and eat more plants regardless of their budget or life circumstances. Susan Sheehan, Incredible Edible Lambeth — sets up local community food projects in her borough. Dee Woods, Granville Community Kitchen — Dee Woods is the co-founder and coordinator of Granville Community Kitchen and was named BBC Food and Farming Awards Cook of the Year in 2016. Ailbhe Bhreathnach, Enfield — Ailbhe is a health strategist at Enfield Council and has been instrumental in encouraging them to take up the good food challenge. Lisa Ashley from Compass Group UK — decisively changed the food outlets across Goldsmiths Uni while building healthier eating habits for thousands of students. The awards are run in partnership with the Mayor of London with support from the London Growth Hub. Following the success of the Mayor’s Behind Every Great City campaign in pushing for greater gender equality, this year sees a new award to celebrate the capital’s inspirational women in food.